Over the summer I had a burst of inspiration one weekday afternoon. I wanted to write a collection of essays, to share as an e-book and audiobook, all about the lessons I've learned about making things happen in our creative work and lives along the way. For the past three years I've had the privilege of working with so many crazy-awesome, brave, and inspiring creative women as their creative coach and I have learned so much from walking with them in their journey and supporting them in their pursuit of an impactful, fulfilling, and sustainable creative business and life. And I've learned so much from my own journey of building a wholehearted creative business too, and there was just so much on my heart that I wanted to share with other big-hearted creatives like you who may need a little encouragement, inspiration, and insight to support you to keep going and keep bringing to life the creative work and life that your aching for along the way. So that is how Nobody is Going To Do Your Business (Or Your Life) For You: & Other Stories came to be. 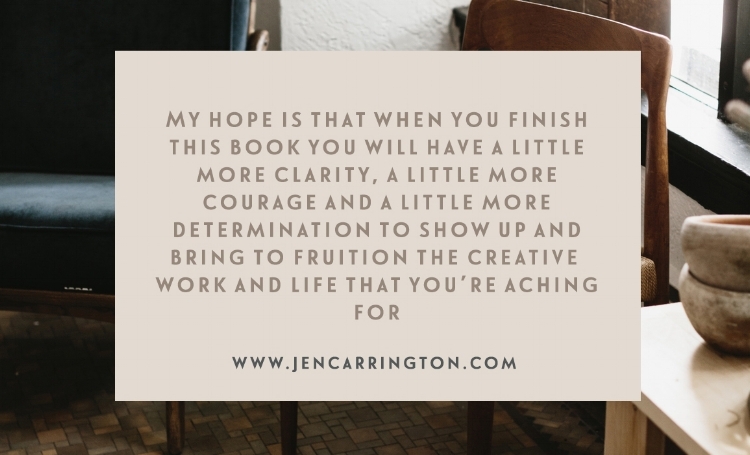 It's a 40+ page e-book filled with 12 essays all about bridging the gap between where you are now and where you want to be in your creative work and life. There's also an audiobook version if you'd rather listen along than read. It's not a step-by-step guide on how to build a succesful business, nor is it sharing strategies, marketing techniques, and ideas for increasing profit and growth. Instead it's a collection of stories, ideas, and lessons I've learned about what it takes to truly show up for ourselves, our creativity, and our business along the way. It's a book about being the bravest version of ourselves in our creative work, and about not allowing our fears, our ego, and the possibility of failure to hold us back from running in the direction of a creative work and life that feels most meaningful to us. I am so excited to share Nobody is Going To Do Your Business (Or Your Life) For You: & Other Stories with you today and if you'd like to dive in and read the book (or listen to the audiobook) you can sign up below and receive access to it straight to your inbox. Look out for a confirmation email in your inbox super soon, and once confirmed you'll then receive Nobody Is Going To Do Your Business (Or Your Life): & Other Stories straight to your inbox! I've had so much fun working on this little book (aside from the inevitable few weeks where writers block hit me pretty hard!) and I really hope you enjoy reading it and that it can be of some encouragement and support to you in your creative journey along the way. As always, I'm rooting for you!